I have several friends who are entrepreneurs, crafters, or hobbyists. Most of them have the desire to share their hobbies or create a small business out of them. In some cases, they might have something like an Etsy store, but often one of the primary platforms they use to sell items is social media, usually via their personal Facebook profile, a Facebook business page, or maybe even a closed Facebook Group. Most of the time, my friends don’t utilize other online marketing and paid advertising strategies to promote and grow their businesses or find more customers. They usually don’t have a website, and they don’t include online advertising strategies as part of their budget. That’s probably fine if your primary goal is promoting your hobby. However, if you’re trying to turn that hobby into a viable business that will then grow, and maybe even allow you to quit your day job, then you need to be more proactive about using Facebook and other social media channels. That means if you want to reach more people and attract more customers, your small business needs more than just a Facebook page or a Facebook Group. Do People Make Direct Purchases On Facebook? If you’re only using Facebook to grow your business, from a digital marketing and online search perspective, you’re missing out on potential customers. Yes, Facebook continues to add more features that allow small businesses and individuals to buy and sell things on the social media platform. Besides Facebook Marketplace, users can also sell items directly from a post on their personal Facebook profile or their Facebook business page. Facebook also allows you to add a shop to your business page as well as designate if you have a Facebook Group connected to your business, including the ability to classify your group as a Buy and Sell type. But do many people actually buy products and services on a social media platform like Facebook? The answer might surprise you, but according to a recent study, it’s not a lot. Sumo Heavy Industries conducted a study that surveyed 1046 adult consumers in the US, aged 18 and up found that 82% of people haven’t made a direct purchase on social media. And if you think it’s because consumers don’t know they can purchase from your small business through your Facebook page or group, or about features like the Facebook buy button, you’re also wrong. Most people know they can buy things via Facebook. They just don’t trust social media. 65% of people surveyed listed worries about privacy and 71% listed security issues as the reasons why they don’t make direct purchases on social media. 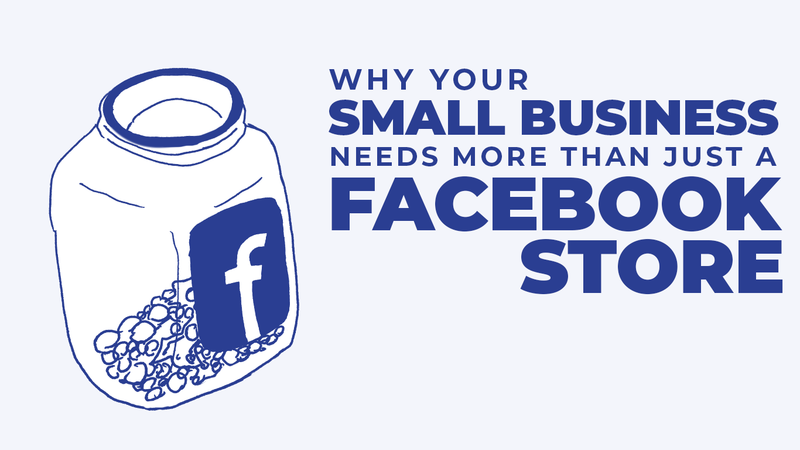 But none of this means that Facebook and social media aren’t crucial for small businesses when it comes to online marketing and growing your business. So if most people don’t make direct purchases via Facebook Marketplace, your Facebook page, or your Facebook group should you stop posting products for sale on Facebook, and stop promoting your business there? Absolutely not. In the same study Sumo Heavy study, 58% of respondents said social media influences their decision to purchase a product or service, and 48% said they bought a product or service they discovered on social media. That means your Facebook and other social media posts aren’t all for nothing. However, just relying on your organic posts, the posts you can create and share for free, is an inefficient “spray and pray” marketing strategy. Over the years, organic reach on Facebook has declined. There are lots of reasons for that including changes in how Facebook’s algorithm works, and changes in the algorithm itself, to increases in content on Facebook, including paid advertising. Your friends and family might see your posts because they interact with you regularly on Facebook, but what about new customers? Merely relying on organic posts probably won’t get you the best return on your investment (ROI), when you consider the amount of time you spend creating and sharing posts that only a handful of people you already know will see, but that won’t necessarily reach new customers. So how do you sell on Facebook or make money on Facebook and grow your business online? You probably already know this, but the answer is Facebook ads. You might be leery of advertising or think it’s too expensive, but if you’re serious about growing your small business, and you want to stay in business, you have to make friends with advertising. Plus, Facebook has some of the most powerful ad targeting there is that allows you to reach people who are looking for the things you provide. You can create target audiences on Facebook based on things like age, gender, relationship status, interests, whether they’ve purchased products like the ones your business offers. Facebook will only show your ads to the people who are most likely to be interested in your products and services. And you can create Facebook ads to accomplish just about any goal, including ads about specific products and services. You can even pay to boost your organic posts to increase engagement and awareness for your business. But if most people don’t make direct purchases on Facebook where should they go to buy what your small business provides? Besides sending customers to your Facebook page or your Facebook group for more information on the products and services you provide, you should be using your Facebook advertising and your Facebook posts to drive more traffic to your website and to convert more of that traffic into business leads. If you only have a Facebook page and/or a Facebook group, you’re potentially missing out on 82% of purchases from customers who might feel more confident purchasing something from your website’s e-commerce store, over the phone with you or a salesperson, or by visiting your physical store. Furthermore, there are many advantages to having a website for your small business in addition to a Facebook presence. Your website allows for a lot more space to showcase your business than your Facebook page and posts do. Your website is made up of multiple pages, and each page will showcase your business to customers as well as guide them on their journey from visitor to customer as they navigate from the homepage or a landing page to a product page or a blog or a video. Think of it this way, your website is an extension of your physical store or business, your Facebook page, Facebook store, or Facebook group is your company bulletin board, and Facebook and other online advertising are well ads. All of these are things that help attract customers to your business so it can grow. A well built, secure website will build trust with your customers. If you have an e-commerce store, people will feel more comfortable making a direct purchase there than from a Facebook store. You can use your Facebook posts to make announcements about new products and special offers, and depending on your budget, you can boost those posts as well as invest in Facebook ads to drive traffic back to your website. Once there, they can make a purchase, read more about a product or your business, and contact your business. If your business only has a Facebook page or a Facebook group, then you’re missing out on customers. Yes, you might be able to sell items to friends and family, and maybe even a few friends of friends. That’s fine if your goal is to share your crafts and hobby with people you already know, but not if your goal is to grow your hobby into a small business. Do you have experience selling things on Facebook? Let us know in the comments below. And don’t forget to like, share, and subscribe.